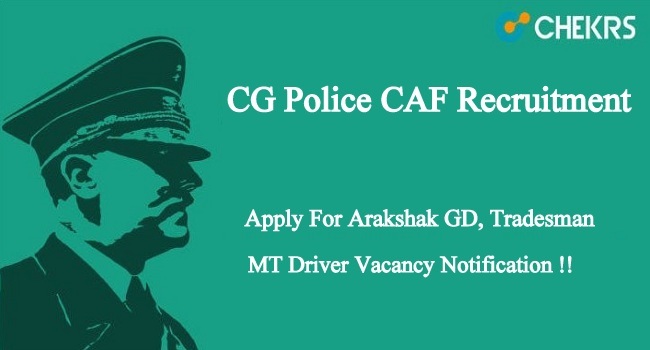 CG Police CAF Recruitment 2019: The Chhattisgarh CAF has invited online applications to recruit GD, MT Driver, Tradesman and for similar other posts. Candidates who are interested in they can apply CG Police CAF Recruitment 2019 through the official website of CG Police (Vyapam). Interested applicants are required to apply for the same from the official website, the last date for CG Police GD Constable Application Form 2019. Further details such as eligibility criteria, selection process, examination date are covered in the below sections. Latest Update: Chhattisgarh Armed Force Constable GD/ Tradesman/ MT Recruitment 2019 will be released soon check details below. The Chhattisgarh Police has been released Arakshak GD & Tradesman Recruitment 2019 Notification on the official website to fill up the various vacant posts. (छत्तीसगढ़ सशस्त्र बल भर्ती): The online application process for Chhattisgarh CAF Police Recruitment has begun soon. Aspirants who are eligible for this recruitment drive, they have to complete the registration in the due course of time. As per the Chhattisgarh Police CAF Notification 2019, no applications will be received after the deadline. Complete details regarding how to fill up Chhattisgarh Police Tradesman Online Form 2019 are given below. Tardes Men, Water Supplier, Cook, Washer Men Aspirant must be 5th Pass. Candidate should be between 18 years to 28 years. However, for reserved category candidates, there are age relaxation criteria which varies from 3 years to 5 years. For more details on this refer to official notification. Eligible candidates make sure that they full fill all the eligibility criteria as specified in the CG Police CAF Recruitment 2019 notification. Failing to this (eligibility conditions) may result in cancellation of the application form anytime during the selection process. Now at the end save a copy of filled application form. Aspirants will be selected on the basis of physical standards followed by a physical fitness test and written test. Those candidates who will clear the first two rounds of selections, they will be shortlisted for the written test which is the final round. Provisionally, selected aspirants names list of CG Police CAF Recruitment 2019 will be published on the official website of Chhattisgarh Police. Note: The application process for CG Police Recruitment 2019 has begun, the process to apply for the same has elaborated in the above section. In case if you have any question regarding the Job profile, you can your queries through comments, our team will reply to you shortly regarding this.